The North Central Kansas Libraries System is a regional System of cooperating libraries whose purpose is to better utilize human and material resources by sharing programs and services. WHAT IS A LIBRARY SYSTEM? 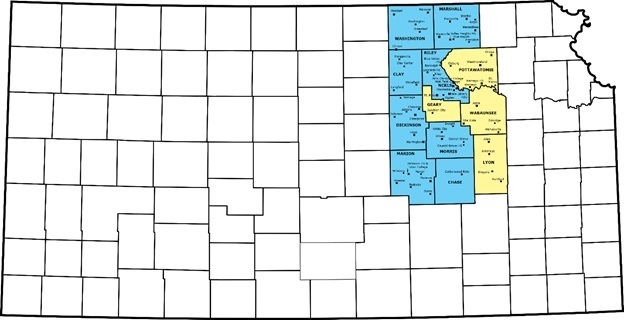 North Central Kansas Libraries System is a regional system of cooperating libraries serving and governed by local public libraries in this area of the state. WHAT IS THE LEGAL FRAMEWORK FOR LIBRARY SYSTEMS IN KANSAS? North Central Kansas Libraries System (NCKL) is one of seven regional library systems in the State of Kansas established by law in 1965 (K.S.A. 75-2547 through 57-2552). NCKL includes the twelve counties of Chase, Clay, Dickinson, Geary, Lyon, Marion, Marshall, Morris, Pottawatomie, Riley, Wabaunsee, and Washington. NCKL population is approximately 230,000 people. Fifty-two libraries are currently participating in system services and programs. Affiliate member libraries are: Blue Valley High School, Council Grove High School, Flint Hills Technical College, Hale Library (KSU), Hillsboro High School, Manhattan Area Technical College, Manhattan Christian College, Valley Heights Jr.-Sr. High School, Wamego High School. Membership and participation in the system are voluntary on the part of each library. Each member maintains its independence and local autonomy. The system is governed by a system board provided for in K.S.A. 75-2550. The NCKL board is made up of one representative selected by each participating library’s board plus eight representatives appointed by the Governor to represent that area which is outside the individual boards’ districts. The system board as a whole meets once a year, and elects twelve members to serve as the Executive Committee for NCKL. The Executive Committee meets every other month. View the system bylaws. The system is financed by a tax on the areas of those counties where a district, township, city, or county library tax is not being levied. Federal and State funds are also made available to help support system services, with additional funds coming from counties that must contract for system services.